Svair wrote: OOC: Thanks Dave! As this was my 1st time using the Dwarf's services, I didn't know that doing this is as time-consuming as it proved to be. Much appreciated. 1. Log off my PC if I am playing, then open up my commands list and gathering list documents. 2. Log on my DM character. 3. Verify what upgrades the player wants for which items. 4. Check the list for each upgrade against the items the PC has collected in their inventory (this is the one that takes forever and requires alt+tabbing out of NWN multiple times) going down item by item to make sure they have collected the right items in the right quantities. 5. Alt+tab out of NWN to find the command code entries for each upgrade and write them down. 6. 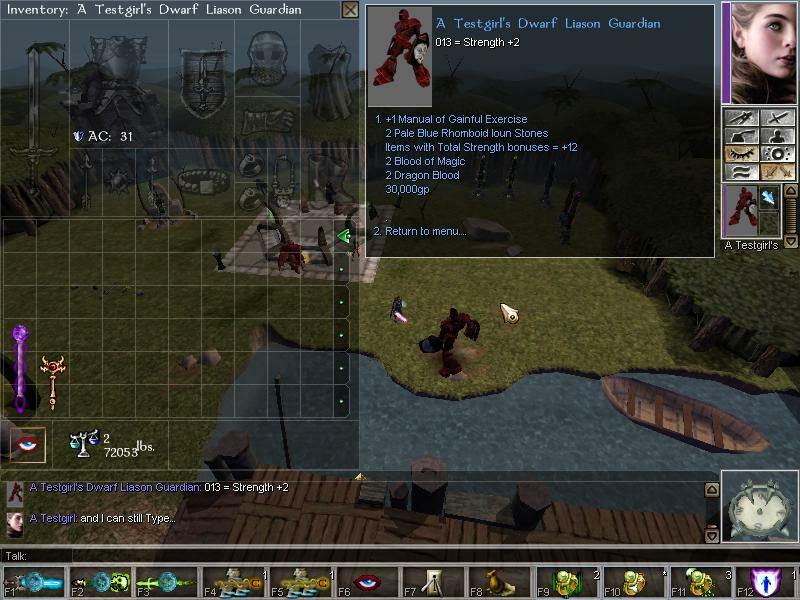 Go back into NWN and select one item at a time, typing in a dm command for each upgrade for that item, then select any additional items and repeat the process. As you may be able to envision, if a person wants more than one or two ugrades done at a time this process can easily go for 10-20 minutes for a single player.... I have spent up to several hours doing this in the past due to there being multiple people wanting multiple upgrades on multiple characters at the same time. The only thing that would make it slightly easier for me would be to have some placeables in the dwarf tower that have all the commands and gathering lists in their descriptions to save on some alt+tabbing.... but there is nothing to be done about the list/item verification process, and thats the really time consuming one. You may not need to. In order to protect my own sanity I am considering ways of limiting how much can be expected of me regarding upgrades in a single session. I am leaning towards 2 upgrades per player per night. I haven't decided yet... but it is clear to me that without some management of expectations, I will either burn myself out, or have players feel neglected/frustrated. Question - can players use the ingame books to scribble things in at all? if so, I wouldnt mind compiling the info in the top of this thread into books for you as a personal reference. to possibly save you the alt-tabbing. If so, lemme know what ya think. The in game tools for 'recording' information have a limit on the amount of text they can capture, hence the reason I havent tried this. The best way is to add the text in the toolset as the description of a placeable or item. 2. There needs to be a limit to the amount of time I will put into doing upgrades for a player at one stretch or I could forseeably be swamped for extended periods which is both no fun for me, and forces others to wait for too long. So, for now, I will be limiting it to 2 upgrades per player per night. There may be times where I am willing to do this for longer periods, but they will be the exception. Right now, the best we can manage is an idea that involves the DM spawning a Horse with Saddlebags, which the player must then assign to themselves. 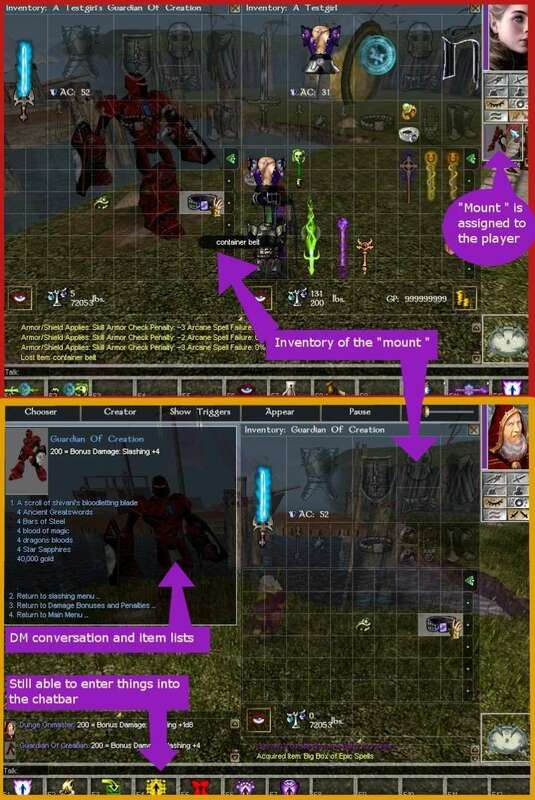 Then the items collected must be placed in the horse's inventory, and the DM can place the gathering list item and property codes item on the horse as well, for easier reference... so that while verifying the proper items and quantities, there should be minimal if any Alt+Tabbing involved. Its a little more work for the player, but a good bit less for the DM which I think is worth it. We want a way for the DM to be able to check the property codes and gathering lists while still being able to type things into the chatbar (mainly the VC commands to do the upgrade). Right now, with all the codes and gathering list information being stored in item descriptions, the DM cannot enter chat commands while looking at those descriptions. If the codes and gathering lists were in a conversation window, the DM would still be able to type... however, this presents the issue of the DM not being able to have an inventory window open alongside the conversation window to verify items gathered . A horse's inventory, however, CAN be open alongside a conversation window (this was news to me, and was totally Rusty's brilliant brainchild). The main drawback we see with our solution thus far is, the horse doesnt quite 'fit' as far as RP for the dwarf or the maker go... and in order to place the codes and gathering lists into a conversation, it would eat up at least 2 or more module resources. A DM command to change the outward appearance of the horse (just the visual appearance, and maybe the name if possible) to something like a bone golem or an intellect devourer would work perfectly for that particular issue. As for the module resources... its really an issue of what can afford to invest. It would be nice to have the convo option, make things a good bit easier and less time consuming for a DM doing upgrades (Rusty has actually been interested and generous enough to start working on the dialogue tree as a pet project, even if it doesnt end up getting used), but it would also need semi-frequent updates to accomodate new gathering lists being added. As it stands, right now, I have the codes and lists on items for my DM which I think will help a little. They are 1x1 scroll items, undroppable, plot items with no powers or abilities. If anybody wants one, just ask if you see me online, I don't mind handing them out to help players reference in-game. See, this is where I've been placing a ton of things in my journal to circumvent the constant Alt-Tabbing [I use the windows key here; same function, easier to do IMHO]. My journal currently has all the items I need listed, as well as marked what items I've already gathered. I'm just not sure what the limit is on the actual journal size. If you can fit all of that in there, you can fit a journal window and inventory window (and on my resolution, one more window, but depending on the computer that may not be doable) and chat at the same time (once you click out of the journal). The best part you ask? You can modify the journal OUT OF GAME! Just open up the .txt file with your DM avatar/character's name attached, copy/paste the lists or whatever you want, save and done. Now you don't have to retype everything by hand. Plus, forgetting to click out of that journal window can mean accidentally editing the info you need out of the lists or totally losing your place. (Unless I am way worse than other people, I think those are actually way too easy to do). If we can get the conversation option working, that would be amazing, and the best all around option (updates and module resources aside). The conversation would be able to display the appropriate code as the NPC's response, and list the items for the property below that in the player's options. Yeah, I've seen scrolling issues so far, and that's with only 15 or so property lists... so all of them would get long, add that other list and yeah, I can see scrolling issues. I will say that I've never had issues with losing my journal entries unexpectedly, but that's largely because I've been using the same computer, with minimal fuss, for just under two years and done quite a bit with it. Personally, I catch myself very quickly if I don't quite click out of the window and I lose little to no text, and absolutely no placement, but that's just me. Either way, I was just throwing the idea out there for ya, just in case it hadn't come to mind. evilkittenofdoom wrote: Yeah, I've seen scrolling issues so far, and that's with only 15 or so property lists... so all of them would get long, add that other list and yeah, I can see scrolling issues. I was using the journal when I first started doing the upgrades.... but I stopped after the second time my journal got wiped. Now, out of curiosity, could other DMs have access to this item/routine? I have never jumped on board to help dave out because of my personal time constraints, but if the process were streamlined like this, I could see fixing folks up much quicker than I'd be able to do on my own. The current horse inventory + dave's books works well enough to streamline it a little, but I think there is still room for improvement... .. ..
RustyDios wrote: Is it possible to have 1d10 slashing, 1d10 bludeoning, 1d10 piercing, 1d10 "element", 1d6 "all other elements", "Extra Slashing/Piercing/Bludgeoning damage ..... ALL on the same weapon ? As for a complete list of gathering materials for each and every property.... no, I do not have such a thing. I add lists as needed when player's request properties that don't already have a posted list. I could forseeably try to make a list for all of them, but I am no .... I think I would go psychotic and hurt/maim myself or someone else. I don't exactly find the list-making 'enjoyable' per se... nor the upgrading items... but way back when someone asked if it were possible, and went to all the trouble to make the Dm commands for it, I felt it was something that was important to facilitate for our players, so I took the ball and ran with it... more or less. Its basically the same thing as why I signed on as a DM, not for myself, but for everybody else. That isn't to say I never enjoy DMing, but my enjoyment is not the main purpose for me being a DM. I am a player first and foremost, just like everyone else, but I am a DM in order to help people enjoy Aenea. Regarding bonus damage on weapons, I am going to say that you can pick ONE damage type as the main (whether it be elemental or physical) and it can be 1d10. All the others will have to be capped at 1d6. If would like to overrule me on this, it is by all means his decision and I will support it. As for a complete list of gathering materials for each and every property.... no, I do not have such a thing. I add lists as needed when player's request properties that don't already have a posted list. I could forseeably try to make a list for all of them, but I am no .... I think I would go psychotic and hurt/main myself or someone else. I don't exactly find the list-making 'enjoyable' per se... nor the upgrading items... but way back when someone asked if it were possible, and went to all the trouble to make the Dm commands for it, I felt it was something that was important to facilitate for our players, so I took the ball and ran with it... more or less. Damn.. and here was me thinking you already have all the lists and have gone list-mad..joke/ lol ..
... and you have helped us all, in countless ways, again and again to enjoy Aenea to it's fullest , that's why i'm trying to "give a little something back", to make DMing a little more enjoyable for you .. I really appreciate the effort, Rusty, thank you. I have updated the gathering list post by embedding the relevant property codes into the gathering lists, also. Took the time to reorganize and reformat, and makes some of the lists more flexible. I'm currently working my way down the list of possible upgrades.. erm.. here.. It took me roughly 4 hours, but that is because I finalized the forum list several times and then transferred it to the toolset items I made.... then decided that I needed two different versions.... one for the forums and one for the toolset. Then I ended up making a lot of changes to the forum one twice more, and had to redo the toolset version each time. Basically for the toolset version, I have two. One is very similar to the forums, has all the same info, but without the forum font/color/spoiler coding or the dwarf's RP snippets (just removes some lines to save a little on scrolling, but the rest is identical to the forums). The other toolset version is my 'shorthand' version, which I spent a lot of time on.... because the full text version has a LOT of unattractive line wrapping that can make it difficult to read (and forces some extra scrolling).... so I shorted as many lines as I could that were wrapping, by abbreviating and/or shortening the verbiage. The shorthand might make it harder for others to read and understand, which is why I opted to have both shorthand and full text.... so that I could hand out copies of both if players wanted. I also changed it so the scroll items should now be sacrificable as well as droppable.... so you can stick them in a container. Since I think I have made all the significant large changes I will need to, the list is fairly organized now and this should make any updates much easier for me. I can't wait to check this out when it's finished. You guys are amazing! 547 = Weight Reduction (10%) ???? Is this correct or should it be 547 = Weight Reduction (100%) ??? Also some further clarification is required .. at current.. from what I can tell .... Bonus Spell Slots of Level 0 are .. erm ... free ... that is to say, using the formula "for each level of the slot ye want", the items needed and the gold required for a bonus level 0 is at minimum "2k gp X 0(level) = 0gp, with 1 itemxxx X 0(level) = 0 items" etc etc .... I'm sure this can't be how daveyeisley meant for it to be ? RustyDios wrote: Also some further clarification is required .. at current.. from what I can tell .... Bonus Spell Slots of Level 0 are .. erm ... free ... that is to say, using the formula "for each level of the slot ye want", the items needed and the gold required for a bonus level 0 is at minimum "2k gp X 0(level) = 0gp, with 1 itemxxx X 0(level) = 0 items" etc etc .... I'm sure this can't be how daveyeisley meant for it to be ? I would say the minimum value to use for the calculation would be 1. Yes, that means 0th level slots cost the same as 1st level slots. I dont see this as a big deal, really. Keep it simple. When I get motivated, I will update the original post. I agree that the normal item idea is a good one for hedging your bets about items getting replaced that you have upgrades on. The normal, nonmagical items in game are the least likely to be replaced. As for the conversation system.... WOW, Rusty! That looks awesome. It would seem you have it working pretty much exactly like we were discussing would be the best way! You rock! If not.. at least I have a really useful "reference table" of upgrades ! Got the email yesterday evening. Going to check out RustyDios' system sometime today (got all the kids home and the wife as well, so my NWN time will be fractured at best today). It looks like impressive work already. I'll probably make a few tweaks to it (such as appearance and such), but it looks likely to be added very soon. Got a chance to work on this late last night, and it's going in with the next planned server reset. I changed the "mount" to an "assistant" that's added as a henchman (and it's inventory opened) automatically via the conversation (during the "Proceed..." part of the PC conversation node. The "assistant" is removed from the party either by the PC when done or automatically when the PC exits the Maker's shop or the Old Dwarf Wizard's tower. This way it's a bit smoother and doesn't require any mount-related actions be performed. I also teleport-blocked those two areas so that PC's can jump away and drag the assistant with them if it's still in the party. The old dwarf wizard's assistant is a skeletal ettin, and the Maker's is a smaller mind flayer. Both function exactly the same. Thanks for all the hard work, RustyDios! If there are updates to the "shopping lists", can someone PM me with those when it happens? I don't keep an eye on those threads unless someone posts there, and I'm not alerted to edits to posts. The Amethyst Dragon wrote: Got a chance to work on this late last night, and it's going in with the next planned server reset. ... I think it's time to figure out a whole new way to present it too.. .. that cut-up version could be improved a lot I think .... .. Lately I've been working on completing the maker's full shopping list. I tend to update my lists every so often based on item rarity... based on my own experiences in finding junk, as well as player comments about the rarity of a given item. Like how with the Maker I used to ask for +2 worth of tomes per +1 ability enhancement... which was back when I would get 3 or 4 tomes per singe visit to a given bookshelf location. That got lowered to a 1:1 ratio, and recently I lowered it down to the same 0.5:1 ratio Dave uses with the Dwarf. It's added right when you pick the "Proceed" option as a PC, then 1 second later it's inventory is opened for you. And after thousands of scripts, items, creatures, areas, etc....oversights are bound to happen. I removed the conditional script that checks for having the assistant as henchman before conversing, then made a very small combo script to both add and open. You know, I haven't read the lists in the forum for so long, I didn't realize they had differences. I just used the same conversation file for both. I think we'll have to find a way to come to an agreement on which list to use for which property. As far as a different color in the conversation...nah, that's kind of a pain, since you have to use custom tokens every time you want to make a color. And damned useful it will be. I'm looking forward to someday being able to try this out. You know, after I've finished my next 6 projects and have a few spare hours of play time. Added for next module update.